The rarest animal in North America, the black-footed ferret was once thought extinct until one population was found in Wyoming. 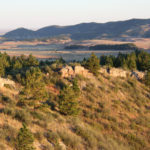 Now, thanks to a tireless restoration effort, small populations can be found in less than 20 places in the Great Plains. Originally established in 2007, the small population of ferrets was added to in 2016. Don’t expect to actually see any of these nocturnal, private animals, but know that they feast upon the local prairie dog population. 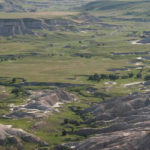 The Conata Basin, south of Badlands National Park, SD, boasts 142,000 acres of intact grassland. In the basin, The Nature Conservancy works with landowners and other to conserve habitat, including that of a small black-footed ferret population. Again, don’t expect to see these elusive creatures.